“Fireproof” gun safes are not constructed the same way as true fire-rated safes. To save costs, most gun safe manufactures use $10 to $20 of drywall (Sheetrock) as fire lining, and then charge you a premium for it. Fireproof gun safes can not meet industry standard tests for fireproof safes. So, gun safe manufactures basically make up their own ratings out of thin air. It is pointless to compare gun safe fire ratings from different manufactures. This article will show you the truth about gun safe fire ratings so that you don’t overpay for protection you’re not really getting. Myth: A fireproof gun safe will protect my guns from fire. – Compares construction of true fireproof safes to gun safes. Explains the limitations and risks of drywall fireproofing. Why you can’t find a true fireproof safe in the gun safe market. Myth: This gun safe is has a UL fire rating. – The truth about this commonly false advertising claim so you don’t get fooled. Myth: Fire is a bigger risk to my guns than Theft. – Is fire protection really the best use of your money? Myth: The average home fire is… – How hot does a home fire actually get? Where do fires usually start? Evaluate your home’s fire risk here. Myth: After Theft, Fire is the biggest risk. – Why you probably should worry more about burglary and floods than fires. Myth: The basement is the most protected area in a home fire. 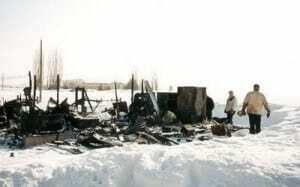 – A common misconception that may guarantee your guns are ruined in a serious fire. Myth: Ammunition is protected in my fireproof gun safe. – Many people don’t think about the dangers of storing ammo in their gun safe. Myth: My gun safe is waterproof. – Why a waterproof gun safe is probably a waste of your money. 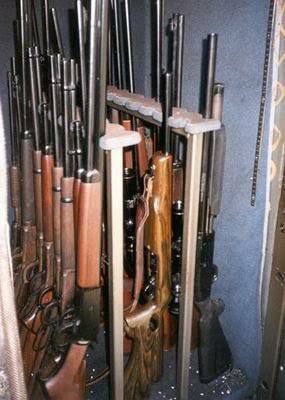 Myth: If the inside of my gun safe stays below the rated 350 °F, my stuff will be safe. – Keeping your valuables safe even if your safe survives a fire. This is the third article in the series What You Need to Know Before Buying a Gun Safe. Myth: A fireproof gun safe will protect my guns from fire. Gun safes offer less protection than you think — much less — and can not pass standard fire safe tests. It goes without saying that no safe is truly “fireproof”, every safe has its limit and will fail at some point depending on how it’s constructed. There are many variables when it comes to fires, no two are the same. In most home fires where the walls collapsed, the contents of “fireproof” gun safe have totally burned up. But you can also find some examples where cheap fireproof gun safes made it through less serious fires with no loss. 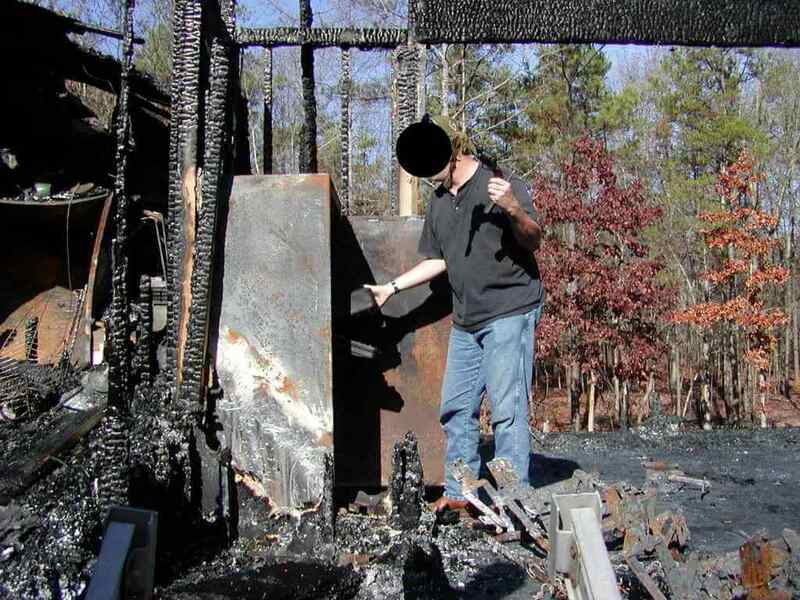 In some fires, gun safes with thick steel but absolutely no fire insulation survived. It all depends on the details of the specific fire. Look closely at after-fire pictures. Here the remaining structure and a gun safe lock that wasn’t melted off indicate that this gun safe didn’t get too hot. Even so, the interior of the door shows heavy fire damage. Here’s another more typical case. Because of the variability from fire to fire, it is difficult to determine how much protection a gun safe gives you by looking at what happened in specific fires. This is why standardized fire ratings are so important. These independent tests are designed to emulate a common worst case scenario to give your valuables the best chance of surviving regardless of the type of fire. There is a well-established fire rating standard in the safe industry, let’s take a look at it. Underwriters Laboratories (UL) 72 is the Test for Fire Resistance of Record Protection Equipment, including safes. There are three classes depending on what you are protecting. Class 350 350 °F Paper. 85% Relative Humidity All above and non-paper records such as computer disks and photos. 80% Relative Humidity All above and flexible computer disks. 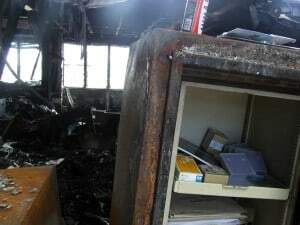 UL Rated Fire Safe protected electronic media in a moderate office fire. For each class, there is an associated time rating: 30 minute, 1 hour, 2 hour, 3 hour, or 4 hour. Note that this time rating is not the length of the actual test; the actual length of a UL 72 test can be up to 80 hours! There are four types of test which may be performed for UL 72. Fire Endurance Test – This is the standard fire protection test. Fire and Impact Test – An additional test where the safe is dropped from 30 feet, to simulate a drop from a 3rd story into a basement in a severe fire. Note that in a fire, heavy beams and other items may also fall on a safe. So, impact resistance is important for a number of reasons. 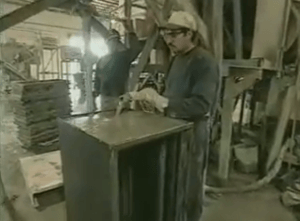 Explosion Hazard Test – Required test to ensure that the safe will not explode in a rapid heating situation from the buildup of pressure inside the safe or safe walls. What goes into a real fire test? 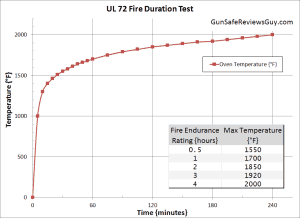 UL 72 Fire Endurance Test oven temperature ramp. Safe to be tested is loaded with loosely distributed paper and/or computer media. To measure interior temperature, the safe is fitted with thermocouples at the bottom, at the top, and all four side walls. For Class 150 or 125 tests, two electronic humidity sensors are included, each 18″ from the top and bottom, located mid-way between all side walls. Class 150 or 125 safes are conditioned for at least 12 hours before the test in an office climate. This ensures the safe interior at the start of the test is between 65 and 75 °F with relative humidity below 65%. The safe is placed in the oven. The oven temperature is increased at a carefully monitored rate shown in the Oven Temperature Ramp plot. Care is taken to make sure the heat is distributed equally to all six sides of the safe. After the final temperature of the test is reached (e.g. 1850 °F for a 2 hour rating), the oven is shut off. The test continues as the safe is left in the oven. The oven remains unopened and is still very hot. The safe remains in the oven for up to 68 hours until the testers see the internal temperature of the safe fall significantly. Only safes whose internal temperature (and humidity for Class 150 and 125) stays below the test limits are awarded certification and become UL Listed. The safe is opened and the contents are examined to see if they’re still in usable condition. The safe interior components and walls are examined for heat and humidity damage. To keep the UL label, a sample safe may be pulled out of production one year later and retested. Many safes fail the UL 72 test at Step 7. Left inside the hot oven, the safe is still absorbing heat even after the oven is switched off. This situation is similar to a real fire, where after the fire is put out, the safe remains in the smoldering remains, absorbing heat. If requested by the manufacturer, after the safe passes the Fire Endurance Test, another sample can be tested for Impact. Safe is prepared as in the Fire Endurance Test. Safe is placed in an oven and heated for the duration shown in the table. Within 2 minutes, the safe is removed from the oven and dropped from a height of 30 feet onto a pile of broken brick on top of concrete. The safe is examined for cracking of fire insulation and opening of interior walls. The safe is placed back in the oven upside-down to simulate landing in different orientations after a fall. The safe is re-heated again based on the specifications in the table below. After the specified duration, the safe is allowed to cool, then taken apart to examine the internal condition, fire insulation, locks, and the condition of the contents. All safes tested for Fire Resistance must pass the Explosion Test. Safe is prepared as in the Fire Endurance Test, but left outside of the oven. The test oven is preheated to 2000 °F. The oven door is opened and the safe quickly put inside and the door closed. The oven remains heated for 30 minutes, then is allowed to cool. No explosion can occur. The safe is opened and examined. The manufacturer may elect to combine the Impact and Explosion tests. UL will heat the safe for the explosion test, then drop it, reheat it and cool it. The cost of having a UL 72 test performed is around $60,000, plus a few safes now and possibly a couple more a year later. Once a safe model has passed UL 72, UL will allow the rating to apply to identically constructed units ±50% of the tested capacity. This cost is required whether or not the safe pass the test. Multiple tests at repeated expense may be required before the manufacturer finally gets it right. This represents a substantial investment on the part of the manufacturer. If you buy a safe with a UL 72 Fire Endurance rating, you can have confidence that you have a good level of protection in a fire. Unfortunately, virtually no gun safes are UL 72 Listed. Those that are UL 72 listed are actually true safes with B-Rate or higher burglary ratings. As you can see UL 72 fire tests are pretty thorough. To meet these stringent requirements, fireproof safes must be well built. Due to the expense of testing, the design of UL 72 fire safes don’t change very often. These are not products which change with passing fads. Instead, much like your favorite firearms, these safes use conservative, tried-and-true construction methods. The vast majority of true fire safes use a true composite construction — fully welded inner and outer steel shells with a poured concrete amalgamate fireproofing in between. During pouring, the safe is vibrated on a shake table to get out the air bubbles. Then the fireproofing is baked in an oven and allowed to harden. Once hardened, the fireproofing directly supports the weight of the safe and interior contents. There is no need for steel frames and supports, which can transmit heat from the outside to the safe’s inside in a fire. During construction, the inner shell is supported by spot welded barrier contact pins, which temporarily hold the inner shell in place while the fireproofing material is poured. The barrier contact pins used to hold the inner liner provide a negligible heat pathway. Also, the concrete amalgamate adheres to the steel outer and inner shells, adding strength. Graffunder Safe After Total Loss House Fire. This safe has 1.5″ of concrete amalgamate fire lining. Concrete is traditionally made of Portland cement, water, and aggregates — usually sand and crushed stone. For high security safes, other materials are often added to increase the strength of the concrete and defeat abrasive cutting tools. However, many strength additives can increase heat transmission. For fire safe concrete amalgamates, materials like vermiculite, perlite, fiberglass are mixed into the fireproofing. These materials absorb heat in a fire and reduce heat transmission, but usually weaken the concrete mixture. Manufacturers trade off security and fireproofing in formulating these proprietary concrete blends. UL 72 Class 150 and Class 125 fire safes have the additional requirement to maintain low relative humidity. To construct these fire safes, generally a poured outer fire lining is used to hold the internal temperature under 350 °F. Then an inner shell is used to block the humidity given off by the poured fire lining. Inside this inner shell, a ceramic wool and/or fiberglass fire lining layer is added. Then yet another sealed shell is often used to keep the humidity low and the inside temperature under 150 °F or 125 °F. Now that we’ve seen a real safe fire rating, let’s compare how gun safes are fireproofed. 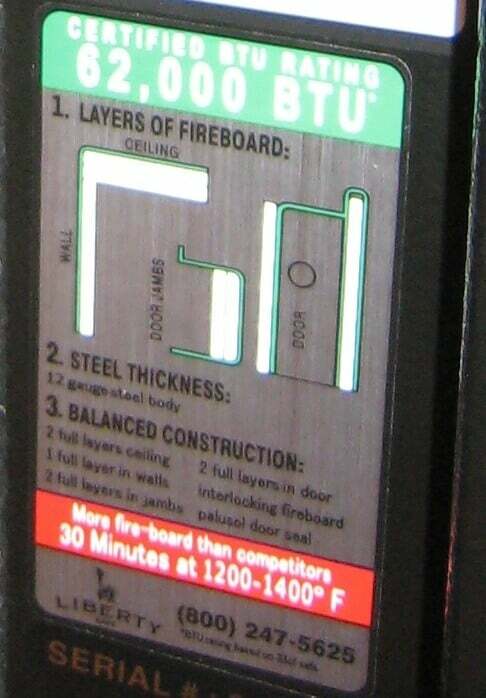 Closeup of door label showing drywall fireproofing. As I mentioned in 16 Reasons to Own a Gun Safe (and 12 Reasons Not To), gun safes are not built like real safes, and this applies to fireproofing as well. It’s essential to understand the fireproofing construction process of your gun safe to figure out if it meets your needs and expectations. The vast majority of gun safes use gypsum drywall (Sheetrock) for fireproofing. Let’s take a look at how this works. Gypsum drywall, a.k.a. firewall, fiberboard, and called fireboard by gun safe manufacturers, is commonly called Sheetrock (a trademark of USG) in the construction trades. In residential and commercial construction, gypsum drywall is used as wallboard over studs. In some construction applications it’s used to slow down the spread of fire. For example, for houses with attached garages, many building codes require double layers of 5/8″ or thicker drywall on the garage side of the walls separating the house and garage. Gypsum is known by it’s chemical name Hydrous Calcium Sulfate CaSO42H2O. It contains 20.9% chemically combined water representing almost 50% of its weight. In a fire, once the gypsum gets above 212 °F, a process called “calcination” will start where the water breaks its chemical bonds and begins to boil off as steam. Converting a sold or liquid to a gas (e.g. water to steam) is known in chemistry as a phase change. A phase change form water to steam is an endothermic reaction. This means an amount of heat is absorbed in the reaction. You know this because you have to heat water to make steam. The amount of heat absorbed for a given amount of chemical varies from chemical to chemical, a property known as the Latent Heat of Vaporization. Cooling using the Latent Heat of Vaporization is how air conditioners work. In the A/C condenser outside your house, the refrigerant is compressed and cooled to a liquid. Then in the evaporator coil inside your air ducts, the refrigerant is made to change phase back to a gas, cooling your home. So inside a gun safe, heat from the fire is absorbed by converting water to steam. If the gun safe is constructed well enough to maintain a door and body seal in a fire, the steam also has a side effect of adding a small pressure to the inside of the gun safe. The positive pressure keeps smoke and hot gasses from coming inside. Until the moisture is gone, the inside of the safe will stay around 250 to 300 °F at high humidity. After all the water in the gypsum is gone the drywall fireproofing will literally “run out of steam”. Note that gypsum isn’t like a sponge holding water, the water is actually chemically part of the gypsum molecules. With all the water baked out, what’s left is no longer gypsum. Instead it’s a different chemical called Anhydrous Calcium Sulfate CaSO4, which will fall apart. Some gypsum fire board is available with fiberglass reinforcement to hold it together better. But, most gun safes don’t have any structural support for the fireproofing material. So, what’s left of the drywall during a fire will crumble into the bottom of the gun safe. With the drywall destroyed there will be virtually no insulation between the scorching hot outer shell of the gun safe and your guns. The contents will rapidly go up in flames. You might hear steam and think of harmless “shower steam” — but, that’s not really steam. The cloud that comes out of your shower is really fog. That fog forms when the warm, humid air around the hot water hits cooler air. The cooler air can’t hold as much water, so the water in the humid air condenses out. Shower fog is actually small droplets of liquid water suspended in the air. Real steam is colorless and very dangerous. Steam is at least 212 °F, but can easily be hundreds of degrees hotter. It will cause near-instant severe burns if it hits your skin, as anyone who’s ever opened a hot radiator can tell you. Also steam, even at 212 °F, will cause more severe burns than water at the same temperature, because of steam’s additional energy due to the Latent Heat of Vaporization. Steam inside your gun safe can be good or bad depending on what you have inside. Note that UL 72 Class 150 and 125 certifications limit the relative humidity inside a fire safe to protect the contents. Many things you could put inside a gun safe, like photos and electronic media, can be destroyed by this steam. If the protective steam from the drywall in your gun safe outlasts the fire, you should get in there as soon as possible before your guns rust or have other damage due to the steam. Unfortunately this is not practical. The rubble will have to cool, your safe may be buried, you may have to wait for the insurance adjuster, and with the lock burned off, you will probably need a safesmith to break it open. If your home has a risk of wildfires, no one may have even been fighting the fire, and the whole area may be off limits for some time. Drywall has been found recently with many nasty chemicals. Formaldehyde is used as a plasticizer in production of gypsum slurry. Unfortunately some gypsum drywall still has high levels of this chemical after manufacturing is completed. Formaldehyde is corrosive to steel, copper, nickel, and zinc. I’ve seen anecdotal reports of formaldehyde corrosion caused by drywall in cheap gun safes. Since many gun safes are now made in China, there’s another concern due to chemicals found in some Chinese manufactured drywall. The Consumer Products Safety Commission (CPSC) and other agencies have found high levels of pyrite (FeS2) in some Chinese drywall. In humid environments (and probably a fire) this drywall can give off egg-smelling sulfurous gases carbon disulfide, carbonyl sulfide, and hydrogen sulfide. These gasses react with and corrode metals, especially copper and silver. 100% of the problem drywall coming from China also tested positive for the bacteria Acidithiobacillus ferrooxidans, which lives in pyrite deposits. This bacteria consumes iron and sulfur producing sulfuric acid. It’s difficult to know what percentage of the millions of tons of drywall imported from China contain problem levels of pyrite in order to figure out the odds that your gun safe fireboard has it. Some gun safes say they’re Made in the USA, but they’re actually made in China and painted here. Other gun safes are actually made in the USA but may use Chinese manufactured drywall which is installed here. It’s difficult to figure out the risk of damage to your guns from drywall chemicals. From anecdotal reports, these problems are more common on cheap gun safes. Despite its limitations, gypsum can be a decent fireproofing depending on how it is used. In fact, the materials mixed with concrete in true fire safes utilize similar chemistry principals to provide fire protection. Unfortunately most gun safes don’t do a good job at implementing their fireproofing, reducing the protection. The first problem with gun safe fire proofing is that there is rarely structural support for the fireproofing itself. The concrete in true fire safes will stand up better to fire even as the fireproofing material mixed in the concrete is destroyed. By contrast, drywall is constructed with nothing but gypsum sandwiched between paper. The gypsum will be destroyed as it protects in a fire, and crumble into the bottom of the safe. The best way to support the fireproofing and protect the contents from the steam released is a fully welded steel inner shell. The shells hold the fireproofing material in place even if it completely crumbles. Steel is the most expensive material in safes, so gun safe manufactures love to cut corners with thinner steel and non-continuous welds (more on this in a later article). If they’re not willing to put decent steel and welds in the outer layer, adding another steel layer to the inside of the walls is just not going to happen. Gypsum fireproofing with fiberglass mesh reinforcement is a step up from regular drywall, although of course less effective than a steel liner. Even as the gypsum crumbles in a fire, the fiberglass mesh will hold it in place somewhat. Some “higher end” gun safes come with this option, but it is still a paltry substitute for real fireproofing. Because the gypsum drywall offers virtually no structural support to the gun safe, support beams, gussets, and other structures must be added to support the weight of the gun safe and its contents. Unfortunately, these structures transmit heat directly from the outside of the gun safe to the interior. Another issue with gypsum drywall, is that it can fall apart due to age and interfere with the bolt work, a not uncommon cause of safesmith service calls. If gun safes have inferior fire proofing, how do they claim 1 hour protection in a home fire? Great question. Gun safe manufacturers who use gypsum drywall as fireproofing don’t bother paying for UL 72 testing because it’s expensive, and their products have no chance of passing. UL 72 listings are the industry and insurance company standard levels of protection in a fire. For safes that can’t pass UL 72, no universal standard for fire ratings testing exists in the fire safe or gun safe industry. Severe competition in the gun safe industry is prompting struggling manufacturers to make increasingly outrageous fire protection claims. But with no testing standard, how do they come up with them? Gun safe manufacturers make up their own fire test procedures. They will either self-test a safe, or have it tested by an independent testing company. Both methods are equally suspect. Either way the safe is tested to the specifications of the gun safe manufacturer. Reduce the maximum temperature the gun safe is heated to. Change the ramp-up time so that for a “1 hour rating”, the safe is exposed to heat much more slowly than an actual fire. For longer duration tests in particular, this is a common tactic. Note from the UL 72 test, the ramp-up stays the same regardless of the test duration. 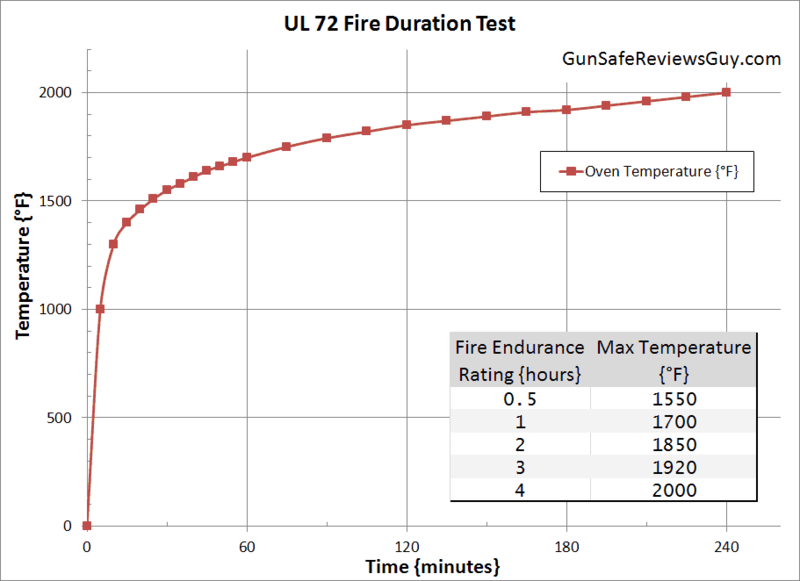 In fact the UL 72 oven profile gets hotter and hotter as the test gets longer, so the test gets harder and harder. Use short test times like 30 or 45 minutes. Note that even in a UL 72 Fire Endurance Test, the oven is still heating up for most of the first 30 minutes. With the deceptively slow ramp up time of independent gun safe fire ratings, the safe is actually subjected to the rated temperature for a very short amount of time. Even if a gun safe was immediately put into a preheated oven, the inside temperature doesn’t change much for the first 10 minutes or so anyway. It takes time for the heat of the oven to transfer to the shell of the safe, then the fire liner, then the interior wall of the safe, then the air, then the contents. Obviously a short test doesn’t tell you very much about how your safe will do in a fire. Use an oven with uneven heating like burners at the top, and/or put the gun safe in the coolest part of the oven. Measure the oven temperature at the hottest point in the oven. Lay the safe down in the oven so it’s not subjected to the higher temperatures at the top. 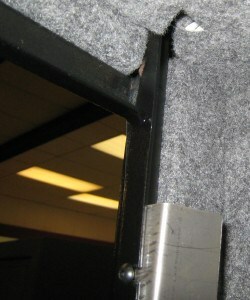 If laid on its back, the weight of the door will also artificially seal the door. Apparently Heritage got caught doing this one. Put additional water inside the safe, wet rags, wet the drywall, etc. Use whatever interior contents and configuration will get them the best result. Play games with temperature measurements. Most gun safes fire ratings specify that the inside won’t exceed 350 °F. How can that be skewed? Put a single thermocouple (measures temperature) at the bottom, the coolest part of the safe. Use the minimum or average internal temperature instead of the maximum internal temperature. Put the thermocouple in a phone book, gun case, or other heat shield to skew the readings. Skip the cool-off test where the gun safe sits in a hot oven shut off. This effectively skips most of the real test. Taking the safe out of the oven immediately after the specified amount of time. In the UL 72 Fire Endurance Test, the safe must sit in a hot oven until the inside begins to cool down, up to 68 hours. If there’s actually a fire, it’s going to be a while before the rubble cools off enough to try and recover your safe. The keypad/dial and other hardware will be melted off so you’ll need a locksmith too. The danger doesn’t end the minute the fire is out. Quench the safe with water immediately after it comes out of the oven. I saw a few videos online where safe manufactures do this for a 30 minute or 1 hour test. Keep in mind that even a UL 72 30 minute test actually represents days in a hot oven, not just 30 minutes. Put it in the oven and rate for whenever the inside hits 350 °F. Basically they’re rating for the time before the inside combusts. In the UL 72 test remember, even for a 30 minute rating the oven is shut off and the inside of the safe has to sit and “cook” in the hot oven for up to 68 hours until the inside starts to cool off. Since gun safe fire ratings throw away that whole part of the test, they don’t have to build the safe to a certain fire protection specification and then redesign and retest it if it fails. Not retesting after design changes. The manufacturer may have tested a safe years ago before changing the design or build materials and not retested it. In this case though at least someone at the company at some point knew what it took to pass the test. Anything else they can think of. In this famous video, the manufacturer plays some of the games I mention above like not placing thermocouples in the top of the Liberty safe (which got hot enough to burn off the lining) and stopping the test, quenching it, and opening the oven immediately at 45 minutes. The quenching step isn’t shown in this version of the video. With that said, it is an illustration of the protection differences between two fireproof gun safes with the same reported gun safe fire rating. So gun safe fire ratings may not tell you very much about how well your guns will be protected in a fire. Comparing fire ratings from two different companies is like comparing apples and bananas. There have been a couple gun safes which were UL 72 listed. A discontinued ProSteel model used poured insulation to achieve UL 72 Class 350 1 Hour. As far as I know, only one gun safe with gypsum drywall fireproofing ever passed UL 72. This was an American Security (AMSEC) model made over decade ago rated only Class 350 30 minutes. AMSEC discontinued it after one year. If a UL 72 rating is so much better, why would companies discontinue these models so quickly after spending all that money for testing? I would guess that they discontinued it because of what sales people refer to as a customer education problem. Let’s assume that competitor Brand X has a gun safe with a bogus self-certified 1.5 hour fire rating rating. This unit actually has much less gypsum drywall fireproofing than AMSEC’s UL 72 model. Brand X can take advantage of uneducated consumers, who think the “1.5 hour” Brand X offers 3 times longer protection than AMSEC’s UL 72 Class 350 30 minute rating. Sell a customer the safe. Educate uninformed buyers why their safe is more expensive than Brand X. Explain why their UL Class 350 30-minute Fire Endurance Rating is actually more protection than Brand X’s self-certified 1.5 hour fire rating. And sell a customer the safe. Notice that Brand X only has to sell a customer a safe, which is hard enough. That’s why in sales and marketing, a product you have to educate the customer about first, before you can sell to them, is considered an uphill battle. Unfortunately this issue of customer education means that it is much easier, and more profitable, to play to customers’ misconceptions than to teach them about safes and sell them a better safe. Hopefully that’s where this site fits in. Gun safes are increasingly being sold at “big box” and other chain stores where the salespeople have zero expertise in safes. In these stores I find salespeople with less and less knowledge of the products they sell, let alone expertise in the industry. With just a few minutes of research, it’s very common that I know more about the product I’m shopping for than the person working in the store. In this environment it’s getting easier and easier for manufacturers to take advantage of uneducated consumers. That is part of the reason why you’ll see high quality gun safes only at true safe dealers. Here an informed salesperson can explain the differences between quality gun safes and look-a-likes. Excellent article, many good points I hadn’t thought of. I would like to point out that citing burglary vs fire incidences without knowing whether guns were stolen is meaningless. It is very possible that a home is burglarized but the guns inside even the cheapest Stack-On safe weren’t made off with, whereas if someone has a house fire, their guns are toast unless, and occasionally even if, they have the best safe money can buy. Good point J. In most burglaries, no guns are taken. Guns are stolen in 4% of reported burglaries; then only 17% of stolen guns are recovered. There aren’t any statistics on what percentage of home fires result in damage to guns. So any comparison to burglaries is going to require lots of assumptions. One way to compare the two would be the average damage caused by each. The average loss per reported burglary (2,110,000 in 2012, FBI) is $2,200. The average loss per reported fire is about 9X higher at $19,000. So, you’re about 6X likely to have a reported burglary than a reported house fire, but on average a house fire does 9X more damage. Guns are stolen in about 4% of burglaries, but probably damaged in a higher percentage of fires as you pointed out. On the other hand they may not be completely damaged by a fire (need a new scope or stock), but when they’re stolen they’re completely gone. To add another wrinkle, there are no loss stats which include gun safes. For example, how many of the 4% of burglaries where guns were stolen involved defeating a gun safe? It’s really easy to get lost in statistics. Which risk (burglary or fire) gets someone’s attention probably has something to do with personality. The burglary/home fire comparison is similar to saying that motorcycles are involved in far fewer accidents, but motorcycle accidents are more deadly. Some people are more comfortable with a severe risk which is unlikely compared to a lower risk which happens all the time. The point that he was trying to make was not that anyway, so not sure why you brought that up? The point he was trying to make was that water caused the most damage and was more frequent. So to say he was wrong in his statistics is not correct, because fire to theft was NOT what he was trying to compare. If he was comparing theft to fire, than your comment would be valid. But since he was really comparing flooding / water damage to both theft and fire, your comments regarding his statistics simply do not apply. With that said, it was still an interesting point on it’s own merit, but was no need to make it look as if he didn’t know what he was talking about. Statistics are always misleading and another variable left out was this. What percentage of homes burglarized were NOT because of a known gun safe in use? And was only 4% where guns taken because only 4% had guns to be taken, making it 100% positive that a house with guns will lose them? It’s VERY complicated, but his point was made regardless of the statistics, which was, be more worried about water then theft or fire. I think your very first point in interesting. As you say, a fireproof safe might help. However, I think many people buy a fireproof safe with the idea that it is totally immune to fire. Thank you for going into the importance of fire ratings, as it is important to understand that the term “fireproof” is relative. If the concrete is a good fire-proofer, would something like fire bricks inside a job site box help in a fire? Interesting idea. The concrete in poured fire safe linings is mixed with other things that give it more fire resistance. The three physics principles behind its fire protection are Thermal Mass, Thermal Conductivity, and Latent Heat of Vaporization. This comment sums up some fire safe concrete additives. How would fire or refractory bricks stack up? – Thermal Mass: The fire bricks will certainly add some Thermal Mass to the walls of a job box. This means it will take longer to heat up the contents in a fire. – Thermal Conductivity: Fire bricks are made to insulate heat, which is a plus. However, if you just line the interior of a job box with fire bricks, there isn’t much stopping the air from transferring heat between the hot outer shell and the inside contents. True fire safes have a continuously welded liner, which helps separate the hot air and gasses in the fire lining from the inside. – Latent Heat of Vaporization: Fire bricks are made to withstand high temperatures without falling apart. Concrete fireproofing amalgamates use additives which contain some bonded water, like Vermiculite and Perilite. In a fire, these water molecules change phase to steam. In the process of changing to steam, the materials absorb heat (like an air conditioner evaporator) but are also destroyed. Fire bricks don’t offer this type of protection, otherwise they’d be single use only. – Door Seal: Job boxes do not have an intumescent fire seal (like Palusol). The lids aren’t usually designed for these types of seals. So a job box will not be able to seal out hot gasses very well in a fire. – On the plus side, job boxes are much lower to the ground than a typical vertical gun safe. Since there is a huge temperature difference from the floor to the ceiling in a fire, this could buy you some time. – Fire Insulation Thickness: The lid of a job box is the highest point, and would need the most protection. Practically, hanging fire bricks on the lid would take some work and make the lid much heavier. If you slam the lid, you won’t want one of the bricks cracking loose and damaging your guns. It’s hard to say how much protection the fire bricks would provide. Without a fire liner, it might be marginal. Some other low-cost options for gun fire protection include high temperature fiberglass insulation like Sturdy Safe uses, sheetrock/fiberglass-reinforced sheetrock, installing a sprinkler head, etc..
All in all, it depends how much protection you’re looking for. It’s good to remember that fire protection will eat up room inside. Job boxes and gun safes fill up quickly. Many rifles with barrels over 22″, and assembled hunting-length shotguns, will have to go in a 48″ job box on a diagonal if fire proofing is added. I would like to give my appreciation for the insight provided in this article. For those not familiar with the regulations and standard guidelines that exist or rather do not exist this sheds light to the consumer in a very direct and informative manner. Thank you! Good article, the one thing I did want to note is the temperatures involved. I had a small business near town. I got a call 1 am of a fire. When I pulled up the fire was already out. The fire chief finished his calculations on the fire. A spark from the fuse box started the fire. But the fire smoltered for about an hour with temps above 900 degrees. The roof had little damage, the compressor exploded and that is what got the fire going. The compressor was 30 feet from the fire. 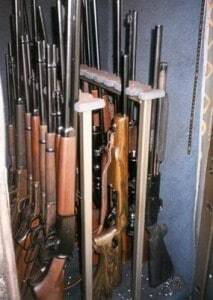 I’d be wondering what my guns would have looked like in a safe. Gooday..
Find: Resources: On-Line Certifications Directory at the bottom of the UL home page, right side of page. This will take you to the UL search page. Type in RYPH for the UL Category Code for the search of UL 72 Listed products. 1. I need a spacer as some of my long guns are too short to reach the barrel holders. 2. Even though the safe is bolted down, added weight wouldn’t hurt anything. 3. More theft protection. A couple of surplus cans filled to the brim is a few hundred dollars. This article has somewhat changed my mind. Although since I keep all my ammo in 30 and 50 cal boxes, I was thinking that the airtight seal and the metal of the can would contain any explosions. So now I’m on the verge. Good article, that offers plenty to consider. I will however give you one reason why some of us want to store ammo in a safe. Everyone’s specific needs will vary. In my household environment, I’m not overly worried about theft, nor keeping ammo out of the hands of children. My main concern IS that of a fire, and I’ll quickly point out that it has nothing to do with actually saving my ammo in a fire. Heck, I’ll have many more things to be concerned with, than replacing my ammo. In the event of a house fire, I want the firemen to fight the fire to their full ability, in hopes of saving as much of my possessions and house as possible. Yeah, we’ve got insurance, but everyone knows there will be plenty of out of pocket expense even with great fire insurance. Then there’s the irreplaceable items that you hope are never lost to a fire, many of which that don’t fit into household sized safe. Mind you, the severity of home fires varies widely. However, after talking with a number of firefighting professionals about this issue, I’m of the opinion that many firefighters are use to hearing ammo bake off in a fire. It does make them nervous. Some firefighters might back out of the fire. However, my impression is that most will continue to fight the fire. However, if there are larger amounts of ammo continuing to bake off, then I believe most firemen will pull back. This is realistic scenario that I don’t want to face; where I watch my house burn to the ground because firemen decided there were excessive risks to them from ammunition baking off. It’s an occurrence that does happen. Obviously, firemen will be especially watchful of a fires proximity to the garage, which they know will have plenty of gasoline, etc. If you’re at home during a fire, you may be asked about explosive materials located in your house, including guns/ammo. From my discussions with firemen, I’m fairly convinced that an answer of “YES” to the question of chambered rounds in guns that are within the proximity of a fire, will cause most fire departments to back away from a fire after everyone is safely out of the house. So with all that in mind, I decided to store my bulk quantities of ammo in a fire resistant safe that’s dedicated just to ammo. Obviously, this is for containment purposes. The added security benefits of a safe is just a slight bonus for me. However, it does help me keep all my ammo organized in one spot… and admittedly, that’s helpful to me. Depending on where a fire is located and how big it gets, hopefully a fire rated safe will significantly delay, or completely prevent ammo from baking off in a fire while the firemen do their job. If I get asked the question from firemen about explosive materials in the house, I can tell them my ammo is secured in a safe where if it does start to bake off, it’ll be contained. Likewise, I can tell them exactly where all the ammo is, and they can decide if they want to give the safe some additional attention with a hose. I just can’t imagine having to face myself and my family, telling them we lost everything when the Fire Dept let my house burn to the ground… just because my ammo stash started baking off, and drove them from the house. I’m sure the insurance company would be none to thrilled with that knowledge either. Lastly, for me, this means keeping my safe in the basement. It gets located in corner with concrete walls, away from potential fire sources (furnace, hot water heater, workshop). Certainly, I could also make a fire resistant container for storing ammo. For me however, the safe is a better option for several reasons which I won’t delve into, as this has already gotten to be a bit lengthy. Thanks so much for your detailed comment! I tend to leave long web comments too; guess I’m not cut out for the twitter/texting generation. I absolutely agree with everything you said. After going back and rereading this section, I realized I hadn’t made the distinction here. Namely that the warning doesn’t apply to storing ammo in a different container than the items you’re trying to protect. I mentioned storing ammo in a separate Job Box or Decoy Safe in Money-Saving Ways to Protect Your Guns, but not here where people would be looking for it. Thanks for catching that, and helping other gun owners figure out how to protect their arms! This is something I have wondered about for some time. I eventually bought an old bank vault. It weighs 1 ton empty and has composite layers in the walls for security and possibly fire resistance.100mm thick walls with 130mm in the door. I am hoping it is fairly fire proof. Anyone have a rough idea how fire proof this might be? It is installed in the garage simply because it required a tractor to install it. Champion claims to have several containers with UL 72 ratings, but I cannot find Champion listed in the UL database. The UL 72 web database is unfortunately unreliable. Searches I’ve done for known UL 72 firesafes have returned cryptic entries, or none depending on the search term. It’s a nice thing if you can find a web database entry, but you can trust a UL placard on the door (from an established firm). Many manufacturers aren’t completely straightforward in their advertising and marketing. But forging an industry standard third-party safety certification is another matter altogether. I assume that could be potentially company-ending liability in the litigious US. The recent horrible wildfires in California have shown that if you live in such an areas your home may burn completely the ground, the fire may go on for hours, if not days, and that firefighters may only get to it after the fire has burned itself out. Is there any safe that withstand such an inferno? I live in CA and am concerned that one day I will be in a fire zone. Thoughts or recommendations on an underground safe? Maybe constructing a small concrete bunker in the garage for valuables? All of the reviews and blogs tell me that a fireproof safe will fail in a house fire due to time or temperature. Sounds like a waste? You don’t have to live in a Urban Interface or wildland area to have a fire conflagration. Just a few that will aid are wind, lack of water and resources, and or close proximity to your neighbors home. I wouldn’t pick the garage for a fire safe but maybe a bunker, they usually have a higher and hotter fire load stored in them. For your “have to save” you may want to look at a ul fireproof media safe.